AC FAN Set To AUTO Or ON – What Is Best? Should the AC FAN be set to “AUTO” or “ON” when running the central air conditioner? I am trying to set the thermostat to save money. The fan blows air into all rooms when I have the FAN set to “ON”. What is the best setting to save money and cool down my home at the same time? Please explain the difference between FAN “AUTO” vs FAN “ON” when setting a thermostat. Setting the FAN to “ON” is not needed to run the AC or HEAT. When the thermostat is set to “ON”, the FAN will run at all times. This is not needed to run the AC or HEAT. 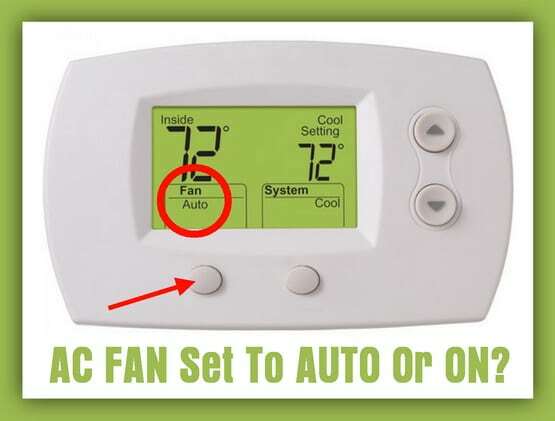 Keep the thermostat set to “AUTO” FAN so it is not constantly running. Save electricity and keep the FAN setting at “AUTO”. What does the FAN setting do? The FAN button on the thermostat sets the blower fan. This FAN blows the air through the air ducts and into the rooms of your house. The AUTO setting sets the FAN to blow only when the unit is cooling or heating the air. AUTO – In AUTO mode the fan runs ONLY when the heating or cooling system is on. ON – If set to CIRCULATE or ON the fan runs continuously even if the heating or cooling system is off. Setting the thermostat to FAN ON will simply move the air, not cool the air. The BLOWER FAN has a switch on the thermostat that has 2 positions. AUTO and ON. If this is set to AUTO, the BLOWER FAN only operates when the furnace makes HEAT or the AC is cooling. If the thermostat is set to ON the BLOWER FAN runs continuously. When the thermostat is set to FAN ON and the unit is not cooling, you are simply MOVING the air, not cooling. The AC can’t dehumidify the air as well when the FAN is ON. The energy use will be higher when the FAN is constantly running. Running the FAN constantly pulls out the air conditioned air. What turns on when I run the AC? What component circulates the air in my AC? When the AC is running, the BLOWER FAN is what circulates the air from the AC through the ductwork to each room. This same BLOWER FAN is the one on the thermostat that says FAN ON or AUTO. When to turn the FAN to “ON” on a thermostat? You may have times where you want to run the FAN by setting the thermostat to FAN “ON” if trying to remove smells or need to circulate the air in your home. If you live in a very dry climate such as the southwest United States, running the FAN for 5 to 10 minutes once the compressor turns off can additionally cool your home. Here is a common Programmable Honeywell Thermostat PDF Manual for reference. Proper Use Guidelines for Programmable Thermostats from Energy Star (Gov). Have some helpful information that you can share regarding air conditioner tips? Please leave your comment below to share with everyone.